Correction: This article has been updated to correct a reference to the Treaty of Hudabiyyah. We regret the error. Commentators far and wide make it sound as if President Trump's decision to formally recognize Jerusalem as Israel's capital is the death knell of the Palestinian-Israeli peace process. In the process, they perpetuate their continual blindness to the fact the Palestinian Authority (PA), headed by President Mahmoud Abbas, considers Israel proper part of the disputed territories and wishes Israel's destruction. The usual talking points blaming Israel and Trump appear ad nauseam. "This looks like a declaration of war on 1.6 [billion] Muslims, basically. 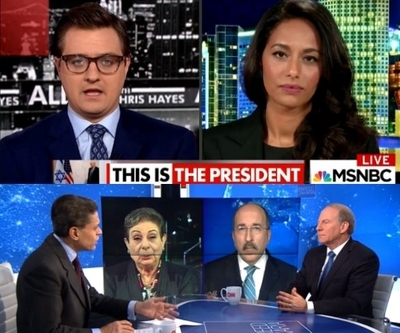 They consider Jerusalem ... they consider the holy site, the Aqsa mosque, the Dome of the Rock, as the most important, the third basically most important holy site for all of them," University of Miami Visiting Professor Rula Jebreal, also an Israeli Arab citizen, said , during a Dec. 6 appearance on MSNBC's "All In With Chris Hayes." "... [T]here is no peace process anymore because Trump destroyed it de facto – and I think also the Israelis and the settlements [ended it]." She conveniently ignores that Israel's seat of government has been in Jerusalem since late 1949. President Trump's decision doesn't prevent future Palestinian and Israeli governments from making East Jerusalem a Palestinian capital. Jebreal's statement also ignores that Jordan, not Israel, has custodianship of the Muslim holy sites on the Temple Mount. Jebreal's hyperbole isn't surprising considering her pro-Islamist bias, evidenced by her praise for Tunisian Sheikh Rached Ghannouchi and Mauritanian Sheikh Abdullah Bin Bayyah, both of whom endorse jihadist terror against Israel. Islam forbids normalizing relations with Israel, the International Union of Resistance Scholars declared in October. The conference's theme was, "The Extinction of Israel is an historical, definitive and Quranic fact." "Giving up Palestine and recognizing the right of the Zionist entity to establish its state on the land of Islam and the Muslims is a betrayal of Allah, His Messenger (Muhammad) and the rest of the believers," the conference's concluding document said. A separate gathering earlier this month of 255 Muslim scholars representing 26 countries in Istanbul signed a "Charter of the Resistance to Normalization" forbidding normalizing relations with Israel. Participating groups such as the Association of Sunni Scholars and the International Union of Muslim Scholars (IUMS) have ties the Muslim Brotherhood and Qatar. The charter said normalizing relations was against Islamic law. The IUMS issued a press release Dec. 6 calling Trump's decision a "red line" and urging Muslims to never "allow to compromise, even if they have to bring great sacrifices." IUMS founder Sheikh Yusuf al-Qaradawi called for jihad "for the sake of Jerusalem." Qaradawi made a similar appeal in July, urging an "Islamic campaign" for Jerusalem. Qaradawi's name appeared first among the 255 signatories of the declaration condemning normalized relations with Israel. Meanwhile, Iranian Quds Force leader Maj. Gen. Qassem Soleimani reaffirmed support for Hamas against Israel, and Hizballah leader Hassan Nasrallah vowed that the Jerusalem proclamation would "be the beginning of the end of Israel." Hamas leaders announced last week that they met with Hizballah leaders together with representatives of Palestinian Islamic Jihad to reaffirm their unity against Israel. Iran and its terrorist proxies aren't alone. "O Allah, liberate our mosque from the occupation's filth," a July Facebook post by Palestinian President Mahmoud Abbas' Fatah faction said. A graphic showed two hands holding the Dome of the Rock. This absolute rejection of Israel's very existence is something too many analysts omit when forecasting doom in the U.S. embassy's move. "Trump's decision fulfilled a campaign promise, but it threatened to unravel one of his top foreign-policy pledges: to broker peace between Israel and the Palestinians," Robin Wright, a joint fellow at the U.S. Institute of Peace and the Woodrow Wilson International Center for Scholars, wrote in The New Yorker. Wright cites Khalil Shikaki as an unbiased expert in supporting her thesis. But she fails to mention Shikaki's pivotal role as an intermediary between the Palestinian Islamic Jihad (PIJ) terrorist group and its U.S. front groups. Wright's Wilson Center colleague and former U.S. peace negotiator Aaron David Miller focused on the issue of trust in the wake of the president's decision. His analysis made zero mention of the unequivocal Palestinian opposition to peace and recognition of Israel. "In a mere 11 minutes, Trump managed to undermine the U.S. role as an effective broker, disrespect Palestinian claims and the sensitivity of the Jerusalem issue and make it harder for Arab states to press the Palestinians and reach out to the Israelis," Miller wrote in a Dec. 11 Politico column. Miller's fears have failed to materialize thus far, and important Arab leaders have put the screws to Abbas instead. Saudi Arabia reportedly told Abbas privately that it had no interest in supporting an all-out Muslim or Arab response against Trump's Jerusalem recognition despite public statements condemning it. Saudi Crown Prince Muhammad bin Salman told Abbas to support the American peace plan. The United Arab Emirates likewise threatened to cut off Abbas financially unless he supports Trump's peace efforts in the wake of the Jerusalem decision. Miller has long argued that ending Israeli settlements on the West Bank would be the silver bullet for peace. Even without Iranian saber rattling, Trump or Israeli settlements, Palestinian leaders would not be terribly interested in peace – only in abolishing Israel. "I have seen that Western commentators actively look for ways to justify PA terror support. They don't judge the actions objectively but look for excuses for the Palestinians. Palestinians are victims. They have no tanks. They are under occupation. I have heard it all," Palestinian Media Watch director Itamar Marcus told the Investigative Project on Terrorism. "Since the excuses are so trivial, and don't justify murder of civilians, it is clear that they are coming with their own anti-Israel bias, and then rewriting the facts based on that bias. That is the only way to explain their justifying murder of woman and children." Palestinians consider all of what was known as Palestine prior to 1948 to be occupied territory. Most Palestinian factions refer to Israel as the "1948 territories," including the Palestinian Authority, whose official newspaper used the term last month. "To Palestinians, Israel in the 1948 territories is the same Israel in the West Bank, East Jerusalem and Gaza," Al-Jazeera English journalist Zena Tahhan wrote on +972.com. "Whether you believe there was a Palestine before 1948 is immaterial; there were more than one million people whose fate was sealed because a European power occupying the land decided to support a movement—Zionism—whose goal could only be realized by the subjugation of the native population." Many experts seem unwilling to acknowledge that Tahhan's attitude represents mainstream Palestinian opinion. Polls show that 2/3 of Palestinians share this attitude, Marcus said. You can't have real peace when one side claims to want peace but continues actively supporting violence. Even when it endorsed a peace initiative in the Oslo Accords, which led to the PA's creation in exchange for recognizing Israel, the move was a means to an end, the late PA President Yasser Arafat said in a 1994 speech. He compared the deal to the Treaty of Hudabiyyah, considered a 'Sulha Dania' [a despicable truce] between Islam's " Prophet Muhammad and Quraish." The Treaty of Hudabiyyah brought about a 10-year truce between Muhammad and the Jewish Banu Qurayza tribe, but the Muslim prophet violated the treaty after two years and seized Mecca. Arafat repeated this comparison in 1995. PA Minister of Religious Affairs Mahmoud Al-Habbash reiterated the sentiment in 2013, in Abbas' presence. "In less than two years, the Prophet returned and based on this treaty, he conquered Mecca. This is the example, this is the model," Al-Habbash said. Hamas founder Sheikh Ahmed Yassin and his successors have offered Israel similar truces, or have offered to accept Israel's pre-1967 borders on a temporary basis without recognizing Israel's right to exist. The terrorist group refuses to renounce claims to the "1948 territories." The Fatah-led PA has been more insidious because of its double talk. Arafat told Israelis in the 1990s that his Palestine Liberation Organization (PLO) annulled parts of its 1969 Palestine Charter that called for Israel's destruction. However, no documentation of this supposed change has ever appeared. Throughout the Second Intifada, Fatah's Al-Aqsa Martyrs Brigade carried out a series of suicide bombings and other attacks. Internal records show that the PA paid Al-Aqsa Martyrs Brigade members involved in terror attacks. Arafat oversaw these terror attacks, PA documents show. Palestinian Authority TV recently glorified suicide bombings against Israel twice this month, airing a music video that calls on Palestinians to become "martyrs" for Al-Aqsa. "The weapons of the resistance are pure, and must be kept. We are increasing our training daily and strengthening our capabilities for the appropriate day, because we are not like sheep going to the slaughter," Fatah Central Committee member Abbas Zaki told a local Hebron radio station on Nov. 9. "All talk of disarmament is consistent with [the interests of] Israel, while the talk of controlling [the weapons] is preparation for the coming day of battle." Marcus argues that the PA has never genuinely negotiated for peace with Israel because of the strong pro-Palestinian slant held by international bodies such as the United Nations. "Since its inception the Palestinian Authority has gone through the motions of pretending to be in a peace process but has never wanted a peace process. Every generous offer from Israel the PA has rejected and they even had to be bribed to come to peace talks," Marcus said. "UNESCO declared Jerusalem only Islamic. It is false and Israel would never agree to that lie – so why negotiate seriously when the international community will grant them political achievements ... unilaterally?" Israel repeatedly demonstrated a willingness to trade land for peace during the 1990s and 2000s. In 2000, then-Israeli Prime Minister Ehud Barak offered Arafat sovereignty over East Jerusalem and a Palestinian state on the West Bank, but Arafat said no and triggered the Al-Aqsa Intifada instead. Yet Israel's critics, like CNN host Fareed Zakaria, continue to cast Israel as the intransigent party. "There are ways to solve the Jerusalem problem," Zakaria wrote Dec. 7 in The Washington Post, "such as by carving out some neighborhoods in the eastern part of the city and allowing the Palestinians to claim those as their capital." Arafat demanded the descendants of Arabs who fled Israel's creation in 1948, estimated at 5 million by the United Nations Relief and Works Agency (UNRWA) today, to return to their ancestral homes in Israeli cities, which would result in Jews being outnumbered in Israel. The Jewish state refused, which caused Arafat to turn down Barak's offer. Zakaria blames Israel while glossing over the extremism of its enemies. In discussing a synagogue project in Beirut during a 2010 broadcast, he held up the terrorist group Hizballah as an example of religious tolerance. "And indeed, the project is said to have found support in many parts of the community, not just from the few remaining Jews there, but also Christians and Muslims and Hizballah. Yes, Hizballah, the one that the United States has designated a foreign terrorist organization," Zakaria said. "[Hizballah's] view on the renovation goes like this. 'We respect divine religions, including the Jewish religion. The problem is with Israel's occupation of Arab lands, not with the Jews.' Food for thought." Hizballah Secretary General Hassan Nasrallah shows his problem is "not with Jews" by denying the Holocaust and describing Jews as the "grandsons of apes and pigs." Nasrallah told Jews in October to leave "Occupied Palestine." Still, U.S. policy experts like Dennis Ross, a former Obama and Clinton Mideast envoy, continue to emphasize Palestinian demands. A peace plan would need "elements in it that the Palestinians and the Arabs will actually see as a good thing," Ross told NPR. Jerusalem is an important part of the peace equation and that "their needs, their rights, their interests" needed to be respected. Former U.S. Ambassador to Israel Martin Indyk likewise focused on Palestinian rights in the days following Trump's announcement. "Palestinian aspirations In Jerusalem appear to be ignored. Israeli claims to the sovereignty over the Temple Mount appear to go unrecognized. Recognition appears to be ethereal rather than geographical since it "doesn't touch boundaries." If your account is accurate it's too clever by half," Indyk told the Daily UAE news site. Council on Foreign Relations President Richard Haass likewise accused Trump of ignoring the Palestinians' interests. "Trump could have recognized it and then also said something about the Palestinian relationship with Jerusalem. The problem with his statement is that it is one-sided and only addresses Israel," Haass told Germany's Der Spiegel. In fact, the president did make a point of emphasizing that his decision to recognize Jerusalem as Israel's capital is not "taking a position of any final status issues, including the specific boundaries of the Israeli sovereignty in Jerusalem, or the resolution of contested borders. Those questions are up to the parties involved." Rather than giving Palestinians an excuse to once again balk at peace talks, analysts could suggest that they agree to hold peace talks without preconditions. Blaming Israel for being reluctant to make further concessions to faithless Palestinian Authority leaders who speak out of both sides of their mouths is insanity. The foreign policy commentariat says Trump's decision threatens the peace process, but what peace process are they talking about? The Palestinian leadership has made it clear long before the U.S. policy on Jerusalem that it has no interest in peaceful coexistence with Israel.